A sport-by-sport round-up of how ParalympicsGB athletes perform on Day Two of the 2012 Paralympic Games in London. John Cavanagh wins through to the quarter-finals of the men's individual compound W1 after overcoming Jerry Shields of the USA. Paul Browne wins through to the quarter-finals of the men's individual recurve W1/W2 after overcoming Poland's Piotr Siwicki 6-4. Kate Murray is out of the women's individual recurve W1/W2 after losing 7-1 to Turkey's Gizem Girismen. Richard Hennahane is out of the men's individual compound - open after losing his 1/16 eliminator 6-4 to Czech Republic's Jiri Klich. John Stubbs is out of the men's individual compound - open after losing his 1/8 eliminator 6-4 to Spain's Guillermo Gonzalez Rodriguez. Pippa Britton is out of the women's individual compound W1 - open after losing her elimination match 6-4 to Maria Rubio Larrion of Spain. Derek Derenalagi misses out on a medal in the men's discuss throw F57/58 final, he recorded 771 points and a mark of 39.37. David Weir who is a world champion and won bronze in Beijing finishes in first place of the men's 5000m T54 heat 3 and qualifies for Sunday's final with a time of 11:28.88. Jordan Howe making his first appearance at the Paralympics qualifies for the final of the men's 100m - T35 after finishing in fourth place (13.75) but Sam Ruddock misses out on a place in the final (13.92). Ola Abidogun is out after finishing seventh in his heat for the men's 200m T46 (23.26). Sally Brown, world and European bronze medallist, is out of the women's 200m T46 event after finishing ninth overall (27.78 seconds) in the heats. GOLD MEDAL - Hannah Cockcroft, wins gold with a new Paralympic record time of 18.06 Hannah who is the current women's 100m T34 world champion, had earlier eased through to the final in a Paralympic record time of 18.24 seconds. However, Melissa Nicholls, making her Paralympic debut at the age of 35, missed out, after finishing 10th overall in the heats. 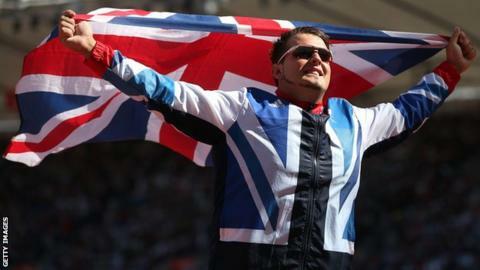 BRONZE MEDAL - Aled Davies (F42 class) has gone one better than his fourth place in Beijing and won bronze in the men's shot put F42/44 event with a final points total of 961 and a mark of 13.78m. Rhys Jones runs a personal best to reach the final of the men's T37 200m. The 18-year-old Welshman finished fifth in his heat, but a time of 24.39 seconds means he qualifies as one of the fastest losers. Shelley Woods reaches the final of the women's 5,000m T54 after finishing as one of the fastest losers in a qualifying time of 13:12.25. Stephen Miller, who won a silver medal in Beijing, fails to reach the final three throws of the men's club F31/32/51 event and is out of medal contention. ParalympicGB women's wheelchair basketballers lose their second successive Pool A match of the London 2012 Paralympics with a 51-24 defeat by Beijing bronze medallists Australia. The men's team found Patrick Anderson too hot to handle as Canada's main man scored 29 points in a 70-54 victory in Pool B. SILVER MEDAL - Jon-Allan Butterworth wins silver in the men's individual 1km time trial C4-5 in a time of 1:05.985. But defending Olympic champion Jody Cundy had a wheel spin from the starting block and asked for a restart which was refused so it was ruled that he did not finish. GOLD MEDAL - Mark Colbourne, fresh from winning ParalympicsGB's first medal on Thursday, wins gold in the men's individual C1 pursuit in a world record time of 3:53.881. SILVER & BRONZE - ParalympicsGB take silver and bronze in the men's C3 individual pursuit. Shaun McKeown (3:38.637) comes in behind gold medal winner Joseph Berenyi of the United States, with Darren Kenny third in a world record time of 3:35.257. SILVER MEDAL - Aileen McGlynn (piloted by Helen Scott) wins silver in the women's individual B 1km time trial in a time of 1:09.469. Lorna Turnham (piloted by Fiona Duncan) finishes just out of the medals in fourth (1:11.479). ParalympicsGB men have held Spain to a 1-1 draw in their opening Group A match. ParalympicsGB men have slipped to a 7-1 defeat by Turkey in their second Group A match. They began with a 11-1 defeat against world champions Lithuania on Monday. ParalympicsGB women have drawn 1-1 with Finland in their first Group C match. Dan Powell loses to Isao Cruz Alonso of Cuba by Ippon and misses out on the bronze medal in the under-81kg category. Marc Powell is out of the under -73kg competition. The 23-year-old, elder brother of Dan, tapped out against Ukraine's Dmytro Solovey in the quarter-finals and things did not improved in the repechage as he lost to Iran's Mohammad Ali Shanani. Ali Jawad finishes in fourth place and misses out on a medal in the final of the men's 56kg. Tom Aggar, who is the defending Paralympic champion in the men's single sculls, eases through to the final in a personal best time of 4:56.65. Nick Beighton and Samanthan Scowen finish second (4:03.23) in their heat of the mixed double sculls, and head into the repechage to compete for a place in the final. Pam Relph, Naomi Riches, David Smith, James Roe and cox Lily van den Broecke reach the final of the mixed cox four, winning their heat in a time of 3:23.59. Matt Skelhon and Nathan Milgate fail to qualify for the final of the men's R1-10m Air Rifle Standing-SH1. ParalympicsGB women are beaten 25-9 25-20 25-14 by European champions Ukraine in their opening match in pool A.
ParalympicsGB men are beaten 25-15 25-17 25-22 by Egypt in their second match in pool B. SILVER MEDAL - James Crisp has taken silver in the final of the men's 100m backstroke S9 with a time of 1:03.62 his team-mate Morgyn Peters finishes fifth with a time of 1:04.79 they had earlier qualified in second (1:04.01) and fourth (1:05.12) respectively in the qualifying heats. Chloe Davies, the youngest member of ParalympicsGB at the age of 13, finishes in fifth place in the women's 100m backstroke S14 final with a time of 1:10.10 she had eased through qualifying finishing in first place. Jessica-Jane Applegate and Natalie Massey also miss out on medals after finishing fourth and seventh respectively. Graham Edmunds fails to qualify for the final of the men's 50m freestyle S10 after finishing 10th overall. SILVER MEDAL - Heather Frederiksen, Beijing silver medallist and European Champion, wins silver again in the final of the women's 400m freestyle S8 with a time of 5:00.50. Earlier she had comfortably won her heat in a time of 4:58.29 but both Charlotte Henshaw (5:42.19) and Emma Hollis failed to qualify (6:02:84). SILVER & BRONZE - Sam Hynd, defending Olympic men's 400m freestyle S8 champion, wins bronze with a time of 4:32.93 he had earlier got through his heat in a time of 4:33.25 to comfortably reach the final. His 17-year-old brother Ollie Hynd wins silver with a time of 4:27.88, world bronze medallist Tom Young finishes fourth and just misses out on a medal with a time of 4:33.57. Harriet Lee reaches the final of the women's 50m freestyle S10 as one of the fastest losers in a time of 29.97 seconds. SILVER MEDAL - Stephanie Millward wins silver in the final of the women's 100m backstroke S9 after finishing second with a time of 1:11.07 14-year-old Amy Marren finishes in fifth place. Aaron Moores and Ben Procter reach the final of the men's 100m backstroke S14 after qualifying in third (1:04.80) and seventh (1:06.01) respectively, but Craig Rodgie fails to qualify after finishing in 12th. Susie Rodgers finishes in fourth place in her women's 50m butterfly S7. She had earlier won her heat to ease through to the final in a time of 37.45 seconds. Matt Walker, who won silver in Beijing, finishes last in the final of the men's 50m butterfly S7. Earlier he had qualified with a time of 33.06 in his heat. Paul Karabarda wins his first Group A match in the men's singles class 7 against Young Sung Kim 3-0. Scott Robertson is out after heloses his second Group A match in the men's singles class 5 to Rene Taus of the Czech Republic 3-0. Jane Campbell is through to the quarter-finals after beating Edith Sigala of Mexico 3-2 in Group E of the women's singles class 3, she had earlier beaten Nergiz Altintas of Turkey 3-1. Sara Head wins her second Group D match 3-2 over Michela Brunelli of Italy in the women's singles class 3. Victoria Bromley loses second Group B match in the women's singles class 11 against Ka Man Wong of Hong Kong 0-3. Kim Daybell lost his second Group A match 2-3 to Hao Lian of China, in the men's singles class 10 he had earlier beaten Brazil's Carlos Carbinatti 3-0. Paul Davies wins his first Group C match 3-0 against Italy's Andrea Borgato in the men's singles class 1. Robert Davies wins his first Group A match 3-0 against Ireland's Philip Quinlan in the men's singles class 1. Sue Gilroy loses her second Group D match 3-1 in the women's singles class 4 against the Republic Of Korea's Sung Hye Moon. David Wetherill loses his second Group A match 3-1 in the men's singles class 6 against Thomasz Kusiak of Germany. ParalympicsGB men's team have lost 70-54 to Canada in their second Group B match, they suffered a dramatic 77-72 overtime defeat against Germany in their first match. ParalympicsGB women's team have lost 51-24 in their second Group A match against Australia, they had lost their first match 62-35 against the Netherlands.